Terminology is an indispensable tool for writers. It’s a dictionary, a thesaurus, a reference tool. Unfortunately, Terminology is only available for iPhone and iPad. There is no Mac version yet, but we can build one by ourselves. Some people can write with iPhone or iPad, but I’m the type who can only write with Mac. The sensation of seeing the words flowing on the screen as you press the keyboard keys is addicting — so does the pain of staring at the blank screen for hours. The hardest part as writer — besides coming up with a straightforward and clear sentence — is finding suitable words to convey my point. Does this word make sense to the readers? Is there any proper words out there for this sentence? Am I using this word correctly? Terminology helps writers exploring the vast selection of words in the dictionary. With the built-in Dictionary, a common word such as restaurant is just a place where people pay to sit and eat meals that are cooked and served on the premises. But when you put restaurant in Terminology, you’ll discover bistro that serves wine, brewpub that serves beer, and an inexpensive restaurant known as hash house. That’s Terminology’s main feature: discover new words. Update 2016-08-11: Agile Tortoise has terminated term.ly website so you can’t use this workflow anymore. Fortunately, they have released a Terminology for Mac Dictionary which you can install for free. The good news is we can use the official Terminology companion online service term.ly to define and explore words. Registered term.ly users can also save their favorite words and keep track of their search history.1 The only drawback with using term.ly is I have to open it with a browser. Alfred is an excellent tool to identify words. I can just type define <word> (or d <word> for faster search) to view the definition with built-in Dictionary. If Terminology is officially made for Mac, I would like to have the same feature for searching word meaning. So I turn term.ly into a Mac app with Fluid and create an Alfred workflow that defines the word with Terminology. 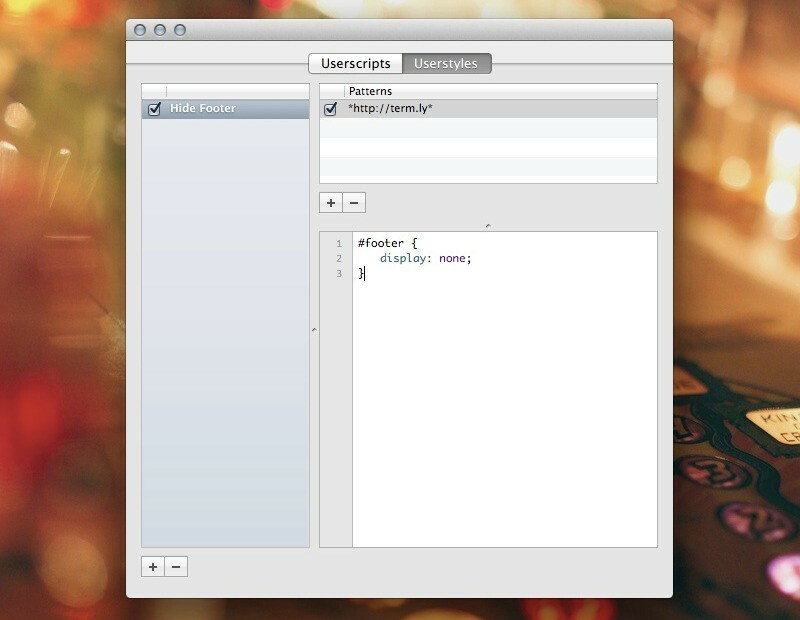 Download Fluid which we will use to turn term.ly into a Mac app. You only need the free version for this tutorial, but the paid version lets you create a separate cookies storage. The next thing you have to do is searching for a sweet icon for Terminology. I recommend the Transmission icon replacement by Jono Hunt who has designed a lot of beautiful app icons (including my favorite Keyboard Maestro). Preparation is complete. Let’s create our own Terminology for Mac. Run Fluid. Enter the URL and the name of the application like this screenshot. Select Create and wait for Fluid to complete creating your Mac app. Now we have to configure few settings to make Terminology looks better. 1. The first thing is to hide the status bar. You can choose View » Hide Status Bar from the menu or just press Command-Slash (/). 2. 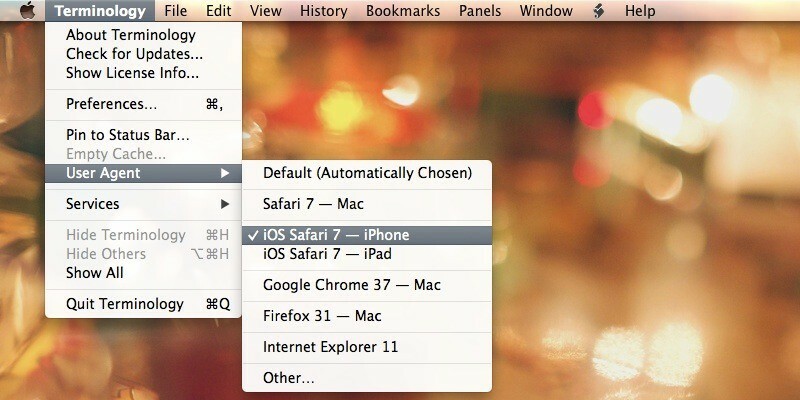 Select iOS Safari 7 as the browser user agent. You can find it under Terminology » User Agent » iOS Safari 7 — iPhone from the menu bar. This will pick the mobile version of term.ly every time you open Terminology. 3. Hide the footer by applying this CSS in the user stylesheet. You can find preferences window under Window » Userstyles. 4. Hide the last browser window to create a smoother experience. This’ll save you a few seconds spent on recreating a new window whenever you define a new word. You can find the settings below. You should be able to use Terminology like a regular Mac app. But it still doesn’t have the same feature I explained earlier. If you’ve followed everything I described in this guide, you should be able to use the workflow I build precisely to define words in Terminology for Mac. This workflow passes the accepted keyword as query and opens the URL in Terminology. The Run NSAppleScriptaction makes sure Terminology is always active — else the workflow will open the URL in the default browser.